2.5 stars Cozy mysteries rank somewhere around chick lit and romantic suspense for genres I don't read much of, out of personal preference. 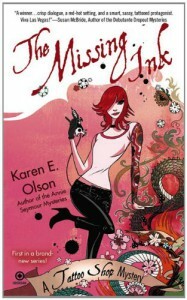 The reason why I chose to indulge with The Missing Ink was because of the tattoo shop setting. I'm not sure if I was expecting more of an edgy slant than what was presented, but I guess there's only so far a writer is going to go in a genre which doesn't push the envelope very often.This doesn't mean that the book was necessarily stale or anything like that. What really stood out to me was the Vegas setting and unusual lineup of characters, which made for several amusing moments. This author has a light handed writing style which was easy on the intake.He stared down at Joel, as if Joel had all the answers. Joel just had a little pretzel salt on his chin. He wasn't Dr. Phil.While I liked how the writing didn't take itself too seriously (which I can't say is unusual for the cozies I've read, but even so, I still appreciate it), I found myself only truly gravitating toward the parts of the story which involved the characters and setting. It almost felt like this "pesky murder mystery" was getting in the way of me reading the parts which I wanted to read, and that isn't good. Granted, I think the "fast and not-so-furious" style of mystery is something I've never really taken to, which is why I don't really indulge much in cozies. So it might be entirely possible that this would work better for true fans of the genre. From what I can tell, the ratings are decent.Will I read book 2 in the series? It's doubtful, but I am not quite ready to ditch the book just yet. Maybe I will at some point when I'm burned out on the usual suspects and need a jolt of something different.